This is the story of 142 E. McMicken and the betrayal of the citizens of Cincinnati by a public institution. The Cincinnati school board voted Monday to spend $182,500 to buy property at 144 [sic] E. McMicken St. in Over-the-Rhine, to make room for the planned renovations to adjacent Rothenberg School. The property is worth just $112,000, according to the Hamilton County Auditor’s Office. CPS wanted to avoid a costly eminent domain case. Thus began the saga of 142 E. McMicken, a beginning that would have been more auspicious were it not for the reputation of its new property owner as a steward in Over-the-Rhine. As one of the nation’s largest historic districts – a dense network of nineteenth century streetscapes lined with breweries, churches, tenements, and other original cultural artifacts – Over-the-Rhine is nationally renowned and protected by local regulations that prohibit demolition of its historic buildings. Owners of vacant buildings in the district are required by city ordinance “to provide sufficient maintenance and upkeep for such structure to ensure its perpetuation and to prevent its destruction by deterioration”. But CPS had made it clear over the past decade that it had little or no interest in adhering to such requirements, and their reputation preceded them. “We’ve got a bad land owner”, then Over-the-Rhine Foundation Executive Director Michael Morgan observed in an August 2008 Business Courier article following the transfer of 142. “It’s particularly bad when it’s CPS”. [A]s recently as Aug. 12, windows were missing, another pane was broken and a rotting cornice remained. Cincinnati Public Schools Facilities Director Michael Burson, who said his staff is stretched preparing for the start of school, said the district pays a contractor to maintain its McMicken properties. The district hasn’t paid VBML fees for the building at 142 because the city hasn’t asked, he said. 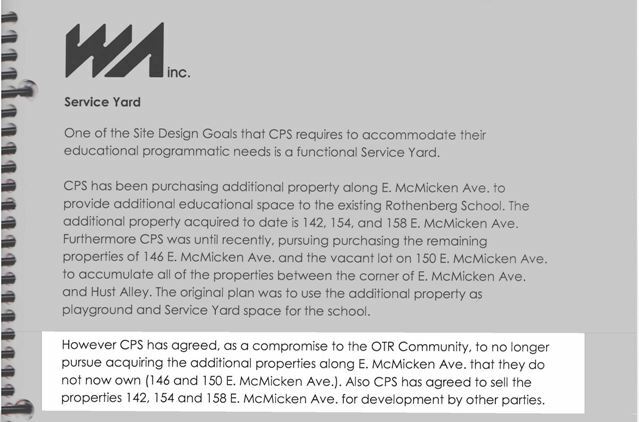 But CPS had no intention of maintaining 142 E. McMicken. In fact, it was purchased precisely so that it could be demolished. 142 E. McMicken Ave. as it appeared on Bing Maps Streetside. The blurs at the top are digital stitching errors, not missing pieces of the building. Among them is 142 E. McMicken Ave., a four-story brick structure owned by Cincinnati Public Schools. The school district wants to demolish the building and two others as part of its renovation and expansion of Rothenberg School at McMicken Avenue and Main Street. Representatives of the school district went before the city’s Historic Conservation Board June 8 to review a preliminary design of the project and explain why they believe the buildings must come down. 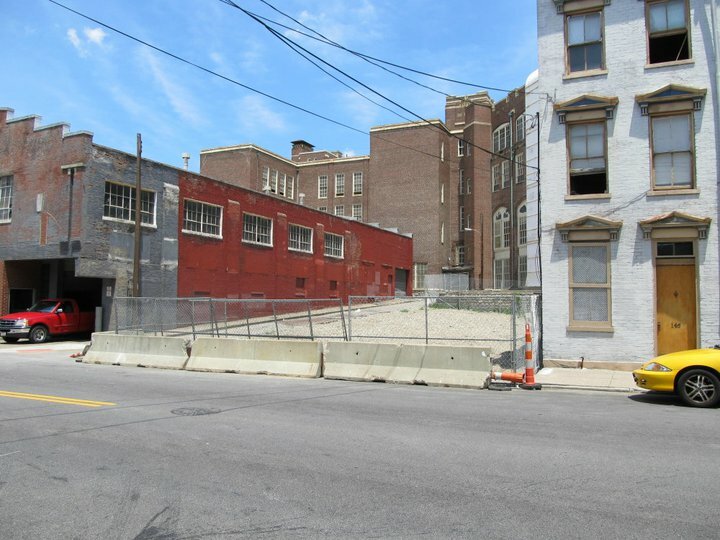 Under the plan…the structure at 142 E. McMicken would be razed for a service yard and to widen access on Hust Alley for service and emergency vehicles. And a newer, light industrial building at 1622 Main St. would be demolished for a parking lot across from the school. But Michael Burson, the district’s director of facilities, planning and construction, said the entire school will be air-conditioned after the renovation…It “would be easier to access and maintain…large chillers, generator and other service equipment” if they were located in the place of 142 E. McMicken Ave. In short, 142 was in CPS’s way, and they wanted it gone so that the space could be used as a service yard. They had applied to the city on February 6 for a demolition permit to tear the building down, and commissioned an engineering report from Steven Schaefer Associates in anticipation of the June Historic Conservation Board hearing. Designed to emphasize the poor condition of the building as a justification for demolition, the report had been submitted to the city in hopes of swaying board members. But the board was not persuaded. Significant concerns over the demolition were raised not only at the June 8 Historic Conservation Board meeting, but also at a series of planning meetings held by CPS for community members. Preservation advocates argued that 142 E. McMicken was important to the fabric of the community and that CPS generators and service equipment would fit without having to tear down 142. Architects for CPS conceded that although it would be a tight fit, there was sufficient room in the existing alleyway and space behind 142 to accommodate all of the equipment necessary for Rothenburg school. The problem with that is history. And over two years ago the public was denied any substantive comment on the demolition of properties on the SCPA site because Cincinnati Public Schools came in and said, these buildings are not part of the plan. We don’t need these buildings. We’re not going to take these buildings down. There’s no room for discussion on these buildings. And then one day they showed up and said, well, you know what? We undermined the foundation of those buildings and we have to demolish all of them. And everybody knew all along that that was part of the plan. So I am concerned with the fact that we hear that we don’t know real numbers. I’m concerned with the fact that everything that we hear today about delay, although very legitimate, is the weapon that will be used in the future to justify cost engineering and destruction of buildings that they have agreed to save. Stated simply, I don’t believe that if these plans are approved these plans are what is going to get built. My Biggest issue is, as mentioned by Mr. Morgan, is that ensuring that what is approved by this Board is carried out. If this is the compromise between the city – or between the school, the school district and the community, we can’t come back later and compromise our compromise and have that driven down. Members of the Historic Conservation Board, however, were pleased with these new developments and happy to take CPS’s word regarding preservation of 142. The Board therefore passed a motion to approve CPS’s plans for Rothenburg, contingent on final approval at a later meeting. CPS’s stated intention to preserve 142 came as welcome news, but the worsening condition of the building should have served up a warning to community members. As early as August 2008 the City had ordered CPS to barricade the building, keep it vacant, and obtain a Vacated Building Maintenance License (VBML). The VBML requirement mandated that 142 should have “roof and flashings [that] are sound, tight, will not admit moisture”, “structural members [that] are free of deterioration and capable of safely bearing imposed dead and live loads”, and “Doors, windows, areaways and other openings [that] are weathertight and secured against entry by birds, vermin and trespassers”. But by October 2009 – 15 months into CPS’s ownership – none of these orders had been complied with. In fact, in nearly a year and a half after purchasing the property CPS had not applied for a single permit to repair the building. In October 2009 CPS began looking for a way out. A private meeting was held at 3CDC’s offices, at which CPS officials asked 3CDC reps if they would be willing to take their McMicken properties (142, 154, and 158 E. McMicken) off their hands. CPS would donate the buildings to the nonprofit development corporation, who would take them and see to it that they were protected and redeveloped. 3CDC assented. A deal seemed imminent, and for a moment it appeared all would be well in the saga of 142. As talks carried on, 142 was left to fend for itself against the elements. With the existing roof needing immediate attention, the building entered its second winter under the care of CPS. From November through March snow and ice entered unimpeded, seeping into craftsmanship that was hundred-years strong. A simple tarp over the roof would have kept the weather out while a more permanent solution was figured out; the 5 story Italianate at 142 E. McMicken would have no such luck. In January 2009 the building was condemned by the City of Cincinnati. Meanwhile, the deal with 3CDC reached a snag. CPS officials remembered that they had paid nearly $200,000 for 142, and reasoned that they had spent approximately $300,000 total on the three McMicken properties. As reported by the Business Courier in March 2010 (“Cincinnati Public Schools targets 3CDC as buyer”) CPS now wanted that money back, and 3CDC would have to pay it. Donating the buildings was off the table. Ken Jones, president of the Over-the-Rhine Foundation, walked through the buildings last fall with 3CDC CEO Stephen Leeper, developer Bill Baum and Michael Burson, the school district’s director of facilities planning and construction. “We are unable to pay the costs that the school board has in those buildings,” Leeper said. The talks came to light earlier this month when Burson appeared before Cincinnati’s Housing Board of Appeals. He was there to appeal the city’s requirement that the school district obtain Vacated Building Maintenance Licenses for the three buildings. The city requires owners of vacant buildings to get VBMLs to help ensure the buildings are maintained and don’t become unsafe. The board voted to give CPS a 60-day continuance on the buildings at 154 and 158 E. McMicken Ave., to give Burson more time to negotiate with 3CDC, said Bruce Goetzman, a member of the board and an architect who specializes in historic preservation. The board voted to deny the appeal for the larger, fire-damaged building at 142 E. McMicken Ave., however, because board members felt the district should stabilize and secure the building right away, Goetzman said. CPS had applied to demolish that building in early 2009 but let that application expire. Burson left the Board of Housing Appeals meeting with the belief that city officials were reconsidering whether the building should be torn down, he said in an e-mail response to questions from the Business Courier. Still, no action by CPS. Spring rains turned to summer storms, but no work and no permits. The community watched and waited for CPS to make good on its promise. August 2010, and the Historic Conservation Board met to formalize approval of CPS’s Rothenburg plans. Under the agreement reached the previous fall, CPS would preserve its buildings on McMicken, while being allowed to demolish a smaller historic building located at 217 E. Clifton. With no substantive change in any of these plans, the board voted its approval. Meanwhile the City had reached the end of its rope. It was early September, more than two years since CPS had taken ownership of its McMicken properties, yet there had been zero compliance with city orders to fix the buildings. In a move described by experts as unprecedented, the City filed criminal charges against CPS for failure to maintain its buildings. The city of Cincinnati is pursuing criminal charges against Cincinnati Public Schools centered on three vacant, decaying buildings in Over-the-Rhine. The district pleaded not guilty at its Sept. 14 arraignment to a first-degree misdemeanor charge of failing to comply with a building inspector’s order at 142 E. McMicken Ave. City Prosecutor Keith Forman said two additional misdemeanor counts are expected to be filed soon on neighboring CPS properties at 154 and 158 E. McMicken. If convicted, the district could face fines totaling $15,000. The charges represent the first time in the city’s history that it has filed criminal charges against another government entity. Indeed it might be the first time any Ohio municipality has taken such action, said Ric Simmons, an Ohio State University professor who teaches criminal law at the Moritz College of Law. “We’re reluctant to talk too much about it because it’s a criminal matter, but we wouldn’t be where we are now if they had taken care of the problem,” said Ed Cunningham, manager of the city’s property maintenance code enforcement division. Hamilton County Common Pleas Judge Russell Mock scheduled a pretrial hearing for Oct. 19 on the initial charge, filed against the district on Aug. 19. Attorney Scott Phillips, representing the district, told Mock that CPS needs about 30 more days to pursue a resolution of the issue. “We’re making progress,” he told the judge. The chairman of the city’s Board of Housing Appeals has run out of patience. “The problem is that they have such a very bad track record of doing the right thing that I think they’ve reached a point where they have played all of their trust cards,” said Michael Morgan. One complicating factor has been the school district’s reluctance to take a loss on the properties. Cincinnati Center City Development Corp. (3CDC) toured the buildings for a possible purchase, but CEO Stephen Leeper balked at the district’s $300,000 price tag. “If we were able to get the buildings for $1, we would do what we need to do to stabilize them and hold onto them for redevelopment,” Leeper told the Courier at the time. 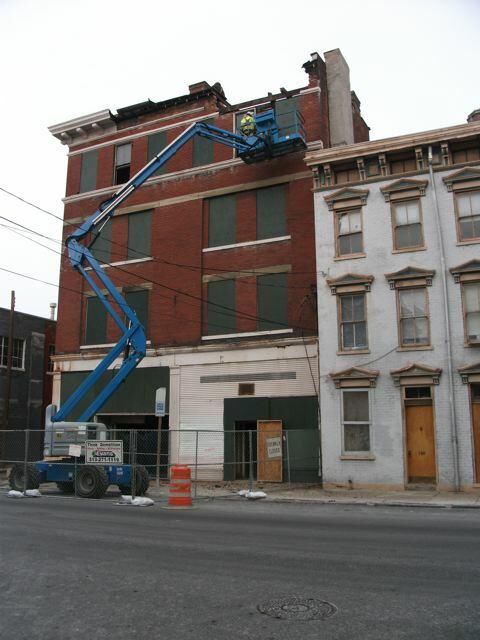 Cincinnati Public Schools faces criminal charges for failing to fix up or tear down three buildings in Over-the-Rhine – buildings neighborhood preservationists insist be saved. The buildings, on McMicken Avenue, abut the Rothenberg Preparatory Academy property. The school board bought them three years ago for about $300,000 with plans to demolish them and use the property for parking and a bus turnaround when Rothenberg is renovated. The buildings stand in a historic district, although board attorney Scott Phillips says the buildings themselves have no particular historic significance. School officials are looking at several options, including possibly selling or giving the buildings to the Cincinnati Center City Development Corp. (3CDC). Because 3CDC is a nonprofit, Phillips said, it has more flexibility in maintaining vacant buildings and wouldn’t have to spend so much money to get a maintenance license. After two years of neglect and facing criminal prosecution, CPS still refused to repair 142 E. McMicken or their other historic McMicken properties. Instead, in September 2010 they commissioned another engineer’s report from Steven Schaeffer Associates in an attempt to cast 142 as an “emergency demolition” – a special category that allows a building owner to circumvent Over-the-Rhine’s historic protections. 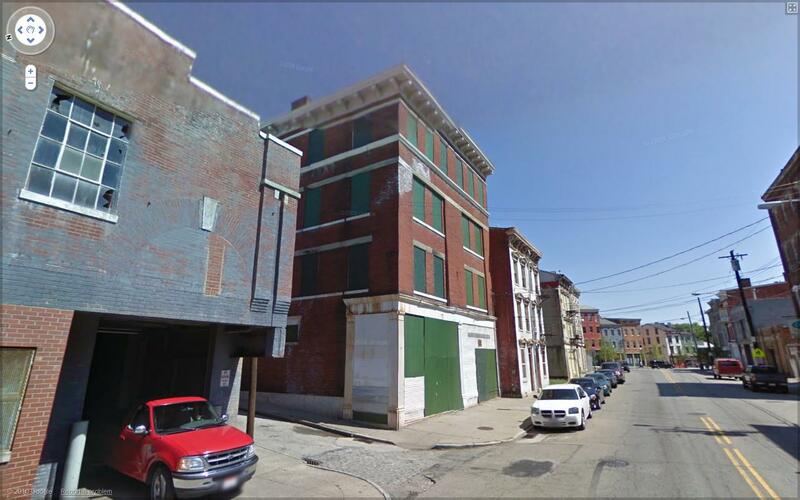 While historic districts such as Over-the-Rhine are generally protected, there is a loophole in the municipal code that permits demolition of an historic structure when it is so badly deteriorated that it poses an immediate threat of harm to the public. This exception was put in place to give the city a way to protect pedestrians and passerby from buildings that are extremely unstable and an imminent risk for collapse. 1101-63.4 Emergency hazard abatement: In case of the threatened collapse of a building, object or device, or any other situation of immediate danger, the chief building official or his designee or the city manager shall be authorized to take any steps which either may consider necessary in the interest of the public safety, with or without notice to the owners or persons in control of the property involved. The “emergency demolition” clause has been utilized by the city on a number of occasions in the past to remove buildings that were visibly crumbling. Invariably these buildings have blatant, critical defects, including eroding brick masonry, sagging windows, falling cornices, and bulges in the walls. 142 showed no cracking in the brick masonry, no bulges, no objects falling into the public right-of-way, no leaning, falling, or moving. It was a shell building – the type numbers in the hundreds in Over-the-Rhine – in need of repair but not in danger of collapse. CPS, therefore, had an uphill climb in order to convince the city that 142 was actually worth of the “emergency” designation; they would have to dramatize the risks in order to present the appearance of a legitimate, immediate danger. Essentially, they would have to create a new definition of “emergency”. The updated engineering report that came back to CPS on October 13 2010 took direct aim at the city’s emergency hazard abatement loophole. Whereas the initial May 2009 report had stayed away from any alarmist language, this report used words such as “immediate” and “life safety” in a deliberate and calculated way. CPS representatives quickly submitted the report to City Chief Building Official Amit Ghosh with the request that he declare the building an “emergency” and grant CPS permission to tear it down. 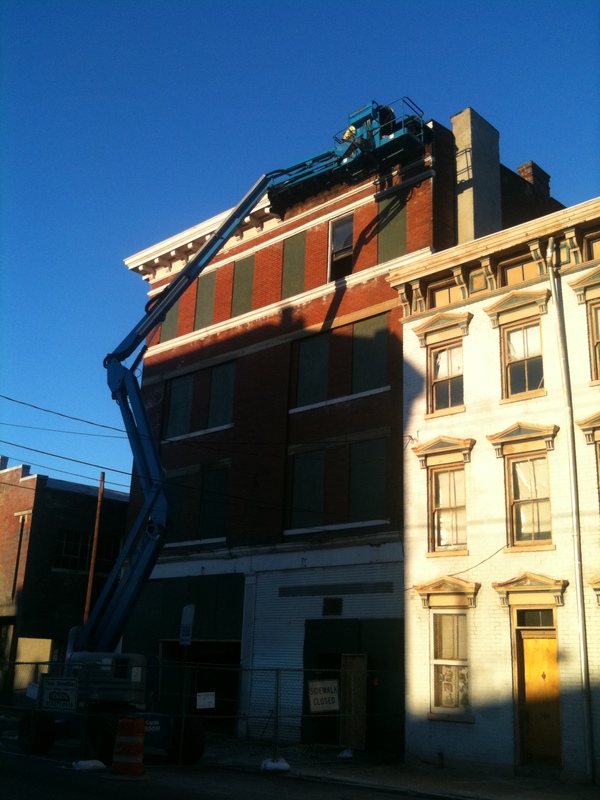 Afraid of a lawsuit should the city refuse to allow the demolition, Amit Ghosh relented, signing an “emergency demolition” order for 142 E. McMicken on December 3, 2010. The document ordered CPS to take the building down by December 16, and noted that if this deadline was not met, the City would enter and perform the work themselves. CPS had gotten what they wanted. They had effectively ordered the City, to order them, to tear the building down. Residents and owners of the adjacent, attached building at 146 E. McMicken noticed a flyer posted on 142 on Sunday, December 5, and quickly alerted community members and preservationists. On December 7, with all city approvals in place and anticipating a firestorm in the community, CPS brought four representatives to Centennial Plaza II to make it clear to city staff that they wanted their demolition permit now. Permit in hand, CPS informed their new contractor – Evans Landscaping – that they could proceed with the $96,000 demolition project. 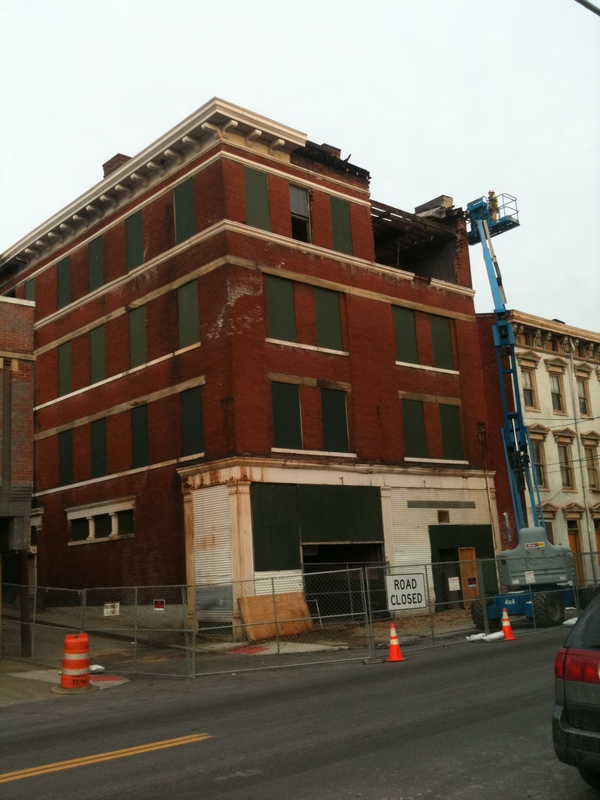 On Wednesday, December 8 2010, crews showed up onsite at 142 and began preparing for demolition. But efforts to halt the demolition were stonewalled at every turn. CPS Board members would not answer or return calls. CPS staff responded that the City had “ordered them” to tear it down, and that they had therefore had no choice. Amit Ghosh claimed that he had felt threatened by the specter of legal action if he did not allow the demolition, and bluntly refused to revoke the permit. Residents and advocates could only watch helplessly as workers began disassembling the building brick by brick, forced to use hand tools to take the imposing structure down piece by piece, avoiding damage to any abutting properties. A last minute court appeal by the Over-the-Rhine Foundation, Over-the-Rhine Community Council, and Brewery District was lost on December 10, and advocates were forced to throw in the towel. The demolition could not be halted, and 142 E. McMicken would be lost. In the end, Cincinnati Public Schools spent an estimated $500,000 for the vacant lot that now stands at 142 E. McMicken. The average vacant lot in Over-the-Rhine costs $5,000. A month later, capitalizing on the permits they had received under the auspices of the preservation of 142, CPS demolished the 180 year old building located at 217 E. Clifton. They demolished 5 historic buildings to make way for the new SCPA, eschewing options to integrate the old with the new in favor of the standards for schools dreamt up in Columbus. And in 2005 it took a massive community effort to prevent CPS from tearing down 22 historic buildings – at the site of modern day Mercer Commons – to make way for a new (and subsequently shelved) Washington Park Elementary. Seven years after the closing of the Rothenburg School in Over-the-Rhine, work still hasn’t begun on the renovation. A vacant lot sits where 142 stood for more than 100 years, a square in the urban quilt that is Over-the-Rhine. That square is now missing, a large gap in the quilt. In fact, 50% of OTR has been lost due to demolition. 50% remains. Half of the nineteenth century community that has inspired so many, half of the community that is drawing thousands of new residents and onlookers into our urban core still stands today. About the authors: This article was written jointly by Danny Klingler of OTR A.D.O.P.T. and Seth Schott of OTR Matters. ← Claim your free email address @iheartotr.com now! My great grandparents raised several children at this address after having immigrated from France. I am saddened to see it go.